Stainless steel permanent mesh filter. 2-speed control switch, 720-Watt motor and large feed chute. Titanium cutting blade system powers through even your toughest, rind-on produce. Easy to clean pulp container which is dishwasher safe. 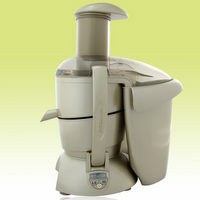 MSRP $159 Based on the Manufacturer's Suggested Retail Price, this juicer is priced about average. Premium Features 4 When compared to other juicers, this appliance has more premium features than average and ranks in the top 15% of juicers. Star Rating 4 User reviews, ratings, and feedback indicates that this juicer is rated about average by 7 users when compared to other juicers.